Royal Brunei Airlines is preparing a new five year business plan which will see it pursue expansion of its regional network within Asia-Pacific. The government-owned flag carrier, which recently celebrated its 40th anniversary, enters a new chapter after completing a restructuring and renewing its widebody fleet. Royal Brunei (RB) is now evaluating several potential new destinations for 2016 and beyond. Expansion will be made possible mainly by a larger narrowbody fleet, which will grow from six to nine aircraft in the new five-year plan, as well as the delivery of a fifth 787. The focus will be on expanding regional operations within Asia as RB is unlikely to expand its long-haul network despite performance improvements following the transition to 787s. But the new A320neo fleet will open up opportunities for new medium-haul routes to Australia, South Asia and North Asia. Royal Brunei’s current five year plan began in Apr-2011 with a major restructuring project which saw the carrier drop five of its 18 routes – Auckland, Brisbane, Ho Chi Minh, Kuching and Perth. RB resumed network expansion in 2014, adding back Ho Chi Minh and launching Bali. But its current network of 16 destinations, including its hub at Bander Seri Begawan, is still three destinations smaller than its network from Apr-2011. RB currently operates the same number of aircraft, 10, as it did in Apr-2011. But its fleet composition has changed significantly – from six 777-200ERs, two A320s and two A319s in 2011 to four 787-8s, four A320s and two A319s currently. ASKs have decreased as the widebody fleet has shrunk in size and transitioned from 285-seat 777s to smaller but significantly more efficient 254-seat 787s. RB’s long-haul operation has traditionally been highly unprofitable but the airline has been able to narrow losses significantly by shrinking the long-haul network to four destinations – Dubai, London, Melbourne and Jeddah – and transitioning to a smaller and more efficient widebody fleet. For the new five year plan, running from Apr-2016 through Mar-2021, RB’s fleet will increase by four aircraft. This is a significant expansion for a small flag carrier which has been in restructuring mode. RB’s new five-year business plan, which is expected to be finished by Nov-2015, will largely focus on selecting markets for the additional aircraft. The key challenge for RB is charting a course for profitable growth. The government shareholder no longer has the stomach for subsidising new routes. RB has a mandate to become commercially viable. RB has the potential of becoming break-even or even profitable over the next five years. RB does not disclose financial figures but incurred huge losses prior to its 2011 restructuring and remains loss-making. “The numbers are improving all the time,” RB deputy chairman Dermot Mannion told CAPA at the 9-Jun-2015 IATA annual general meeting in Miami. Mr Mannion, an ex-Aer Lingus CEO who was appointed by the Brunei government just prior to the start of RB’s restructuring exercise, said load factors are now above 70% and are continuing to rise. New revenue management efforts are starting to bear fruit, giving RB confidence it can continue to boost load factors and yields. RB has historically suffered from unsustainably low load factors and yields which are well below industry averages. RB seems to have concluded its restructuring phase, which included a rebranding, service enhancements and fleet simplification exercise. RB is now following a boutique full-service carrier model, aiming to carve out a niche in the intensely competitive Southeast Asian marketplace. With the 787s RB has been able to significantly improve its long-haul product while reducing unit costs. RB will be introducing a new short-haul product with the upcoming A320ceo deliveries, which perhaps represents the last step in its transformation. The airline also recently unveiled a new website further cementing its new brand and image. RB decided to lease the two additional A320ceos rather than wait for the A320neo as it wanted to start phasing out its older equipment and introduce a new short-haul product sooner. The A319s will be 12 years old when they are replaced, according to the CAPA Fleet Database. RB’s four existing A320ceos are only slightly younger, with three aircraft also 11 years old and one aircraft eight years old. These aircraft are expected to be replaced in 2017 and 2018 as new A320neos are delivered, completing the transition to a new short-haul product. The decision to take new A320ceos means RB will be operating A320ceos alongside A320neos until 2023 as RB has committed to leasing the two new aircraft from AWAS for eight years. But RB does not believes a split ceo/neo fleet poses a challenge because there is significant commonality between the two types. The only major difference is the engine but this is manageable as RB outsources its engine maintenance. RB was also keen to add capacity by transitioning its current A319 routes to A320s. RB configures its A320s, with 12 business and 132 economy seats while its A319s have only eight business class and 114 economy seats. As a result all flights now operated by the A319 will see an 18% increase in seat capacity later this year, including a 50% increase in premium seat capacity. The premium increase is noteworthy as RB sees good business class demand on regional routes. RB has been considering a larger business class cabin for its future A320neo fleet but for the additional A320ceos will stick with the same 12/132-seat configuration. RB currently operates the A319 on some of its flights to Bali, Bangkok, Ho Chi Minh, Jakarta, Kuala Lumpur and Kota Kinabalu, according to OAG schedule data for the week commencing 15-Jun-2015. A319 flights account for about 10% of RB’s total seat capacity, which means RB will see about a 2% increase in total seat capacity as the A319s are replaced by A320s. 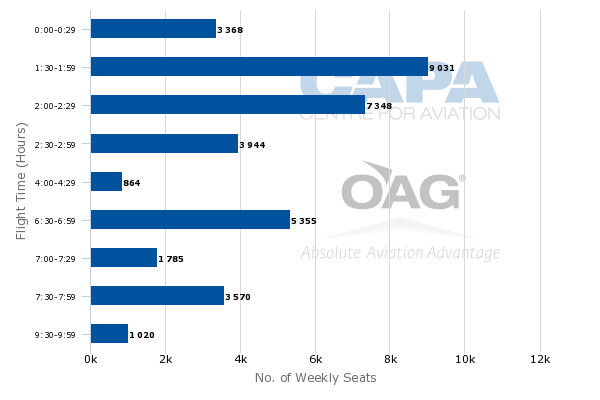 For the carrier’s regional operation the increase in seat capacity will be about 4%. The upcoming capacity increase to RB’s short-haul network is relatively modest compared to the increase planned under the new five-year plan. While RB’s future regional capacity levels will ultimately hinge on upcoming network decisions there will clearly be significant growth as the narrowbody fleet is increasing by 50% over the course of the new five-year plan. In May-2014 RB placed an order for seven A320neos plus three options. Mr Mannion said all seven firm aircraft will be delivered by the end of 2020 while the three options would be delivered after Apr-2021 if exercised. As a result, RB’s narrowbody fleet will grow from six to nine aircraft over the course of the new five-year plan while the options would provide potential growth in the five-year plan that runs from Apr-2021. RB’s four existing A320s are being returned over the next five-year plan. This will leave the carrier with a narrowbody fleet of nine aircraft at the end of the plan in Mar-2021, including two A320ceos and seven A320neos. 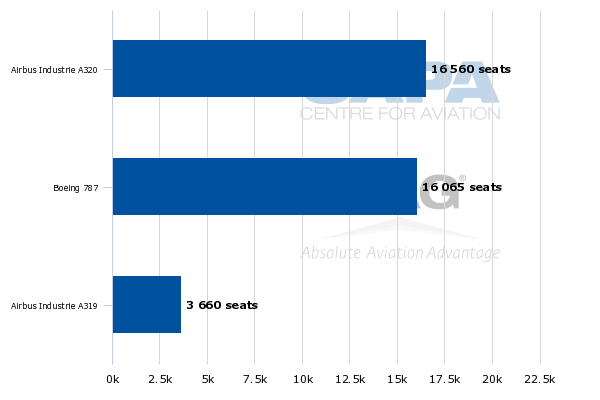 While the nine aircraft equates to 50% growth based on fleet size there could be an even sharper increase in seat capacity. For one aircraft utilisation rates, which are relatively low at RB, are likely to increase as the fleet becomes significantly younger. RB also has the opportunity to accelerate capacity growth by opting for the larger A321neo. RB’s A320neo order gives it the flexibility to change the aircraft type for any of the seven delivery slots. RB is now evaluating the A321neo and also plans to review the recently launched A321neoLR, which is able to operate flights of up to eight hours. The A321neo is a potentially attractive option as RB could use a larger narrowbody to add capacity on short-haul routes that are currently slot constrained such as Hong Kong, Manila and Shanghai. The A321neoLR meanwhile could open up new longer-range routes such as India, a market RB is interested in eventually serving. 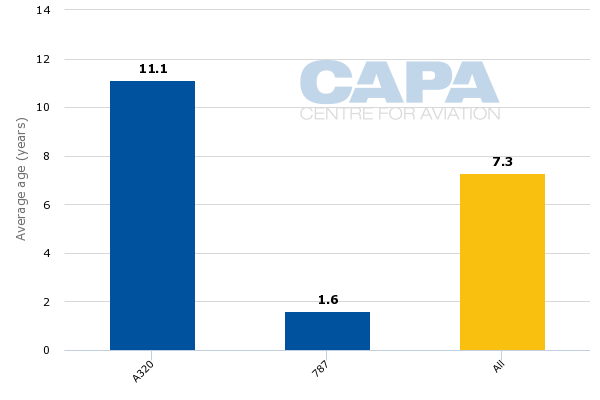 The A320neo/A321neo also offers significantly improved range compared with the current generation aircraft. For example, Airbus has informed RB that all of Australia could be reached with the A320neo. All of North Asia should also be feasible without having to commit to the A321neoLR. Of the 11 destinations in RB’s current regional network, 10 are three hours or less flight time from Bandar Seri Begawan. The only exception is Shanghai, which is essentially RB’s only current medium-haul destination at slightly over four hours. While RB will continue to expand its regional short-haul operation the new five-year business plan will see the carrier start to explore opportunities for regional medium-haul growth. As CAPA has previously highlighted, RB is potentially interested in launching services to Beijing, Seoul and Tokyo. Securing slots at Beijing will be challenging but is being tackled as RB works on its new five-year network plan. In Australia, Brisbane and Perth are possibilities with the new A320neo fleet, as well as Sydney. All three cities as well as Darwin were previously served by RB, although Darwin and Sydney were cut prior to the 2011 restructuring. Only Darwin was served with narrowbody aircraft. RB’s former Australian routes were all highly unprofitable but could potentially become viable with smaller more efficient new generation aircraft. However this is hardly guaranteed. RB plans to look closely at the economics of such routes because while they would all be feasible with A320neos the yields may not be sufficient to cover the unit costs. Melbourne is also a possibility for the A320neo and certainly would be within range of the A321neoLR. But changing the gauge on Melbourne, which is now served daily with 787-8s, could create a dilemma as RB would need to find a new long-haul route to keep its 787s utilised. The only other regular route for RB’s 787s is its daily Bandar Seri Begawan-Dubai-London Heathrow service as Jeddah is served only on a seasonal basis. As CAPA wrote in Aug-2014: "Melbourne is unlikely to become profitable in the foreseeable future but will be maintained as RB needs more than just one long-haul route from a network and operational perspective. The Bandar Seri Begawan-Dubai-London route is considered a nationally critical route that cannot be cut. Serving London non-stop is also not an option as RB does not believe it is feasible with the 787-8 without payload restrictions." In addition to expanding its narrowbody fleet RB is taking a fifth 787-8 during the course of its new five-year plan. This aircraft, which will boost RB’s total fleet to 14 aircraft, could provide even faster growth across the regional network as RB is unlikely to grow its long-haul network. RB took the first four 787-8s from its five-aircraft commitment in a six-month span from Oct-2013 to Apr-2014, replacing the six 777-200ERs which had been leased from Singapore Airlines. RB initially was slated to take the fifth 787-8 shortly after the fourth aircraft but the carrier wisely decided to defer delivery of the last aircraft to 2018. The deferral enabled RB to hold off on expanding its long-haul operation and instead focus on continuing to try to improve long-haul profitability. Following the 2011 restructuring RB clearly did not have a need for five long-haul aircraft. As part of its new five-year plan RB is looking at deploying the 787 on more regional flights. RB has had success over the last year at using the existing 787-8 fleet to operate flights to Singapore during peak days (Fridays and Sundays). The 787 has been a popular product on the Singapore route particularly among business travellers. Singapore along with Kuala Lumpur, which could also eventually see the 787 on some flights, are strong business destinations from Brunei. The 787 features 18 lie-flat business class seats, providing 50% more premium capacity than the A320. Combined with the two additional narrowbody aircraft, the use of the fifth 787 regionally could result in a significant increase in capacity on routes within Asia. The expected expansion of regional operations – with a combination of additional frequencies and up-gauging existing frequencies to its current regional destinations along with several new routes – is a more sustainable option than resuming long-haul growth. RB’s regional operation has typically performed much better as it relies more on higher yielding local traffic. On average about 70% of RB’s traffic on its regional network is point to point while 80% of traffic on Dubai, London and Melbourne is transit. By the end of 2020 RB will have a fleet of 14 aircraft and a total fleet seat count of 2,566 (assumes the A320neos will have the same configuration as the A320ceos). This compares to its current fleet of 10 aircraft and 1,836 total seats, translating into a 40% increase over the next five years. RB’s expansion plans seems rather ambitious given the small size of Brunei’s local market and the fact it only recently completed a restructuring. Brunei has a population of only about 400,000 and the local market – while very affluent as Brunei has one of the highest GDP per capita in the world – is unlikely to grow as rapidly as its Southeast Asian neighbours. But RB has opportunities for regional growth, particularly if it can succeed at carving out a niche under the radar screen of LCCs and larger full-service network operators. There will be challenges as RB will inevitably have to pursue more short-haul transit traffic as it builds out its regional network, which will expose it more to competition with LCCs and regional FSCs. However RB should also benefit from operating a highly efficient and simplified fleet, giving it a more competitive cost structure. While Royal Brunei’s outlook is still far from sunny it is certainly a lot brighter than it was five years ago.